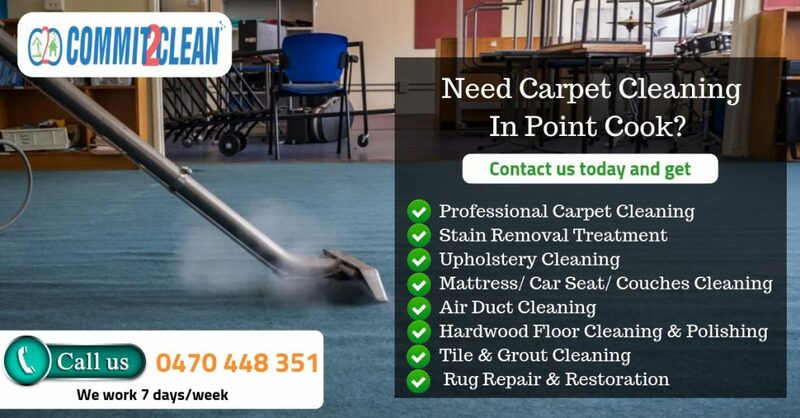 Carpet Cleaning Point Cook is your one stop shop for all carpet cleaning, rug cleaning and upholstery cleaning services. As an insured and licensed residential and commercial cleaning company in Point Cook with tons of experience, our professional personnel will have your carpets looking younger and cleaner in no time. Our carpet cleaning company has many advantages over trying to do it yourself. Commit2clean experienced cleaners have capability to save you time and money with our high-end, powerful machines that is much more effective and efficient. If you’re anxious about the health of your home, Carpet Cleaning Point Cook has top of the line equipment’s and cleaning agents for all kind of carpet cleaning and a lots of other options which you can choose from our service. All of our products are biodegradable and self-neutralizing. We will discuss with you to determine which method of cleaning your project will suit at time of schedule. So what are you waiting for? Call us at 0470 448 351 for your inquiries and reservations. All our carpet cleaning experts are available 24/7 for all your cleaning needs. The majority of our customers can get hands on, speedy, comprehensive carpet cleaning helping hand any time of the year within the location of our spot. To follow up the cleaning, our company applies turbo fans to accelerate drying time and rake carpet fibers to restore the pile. Our exclusive method leaves no soapy residue that keeps carpets cleaner longer as well as being safe for the children and pets. You will see Carpet Cleaning Point Cook is the unique way to protect your investment. Don’t delay and book your desired service today! The customer service team will answer all of your questions and concerns and will advise you on the price you will have to pay.